Developing and utilizing accurate computer Decision Support Systems (DSS) for nitrous oxide (N2O) emissions from soils could help predict how various land use management practices would affect emissions of this greenhouse gas. William Salas, president of Applied Geosolutions, LLC is developing a geospatial DSS for N2O emissions, utilizing an assortment of digital data, research data, and a biogeochemical model. The DSS is being used estimate and map nitrous oxide emissions at various site levels, and the potential effect of land management practices on these emissions. Salas is also working on methods for scaling up the results to extrapolate from site scale to watershed scale and beyond. The biogeochemical model being used by Salas is the process-oriented DNDC (DeNitrification-DeComposition), developed by Changseng Li, of the University of New Hampshire’s Institute for the Study of Earth, Oceans, and Space. The core of DNDC is a soil biogeochemical model, which can be linked to various other models or GIS and climate databases for purposes of mapping or estimating the fate of carbon and nitrogen in a terrestrial system. The core DNDC model is based on biogeochemical concepts for predicting soil carbon and nitrogen fluxes. The model links the impact of specified ecological drivers (climate, topography, soil, vegetation, and anthropogenic activity) on carbon, nitrogen, and water cycles. All three elemental cycles (C, N, and water) are linked through a biogeochemical field that includes radiation, temperature, moisture, pH, Eh, and substrate gradients. Salas is using the DNDC Biogeochemical Process model in combination with GIS-based spatial information to produce the NUGGET-DNDC data mapping tool -- a web-based, GIS-based Decision Support System for predicting the fate of C and N in a given site. Salas first incorporates data on climate, soils, land use cropland management practices, and hydrology. He uses a variety of climate data in developing the NUGGET-DNDC mapping tool, including DAYMET, NEXRAD, and NCDC station data for the U.S. For soils data, Salas uses STATSGO and SSURGO. The land use and crop management data come from a combination of aerial photos, satellite data (Landsat, MODIS, and SAR), and USDA Census reports. Once this basic data have been compiled for a given site, the next step is to take into account the effect of different agricultural management practices (using field research data). This information is then processed through the DNDC model, which simulates the carbon and nitrogen cycles and incorporates the biological and physical factors that affect those cycles. The final analysis is subject to whatever sensitivity analysis is desired, and a product is generated. The final product is a map of the site (such as a watershed) showing a predicted range of possible nitrous oxide emissions at each point in the site as a result of changes in management practices. The NUGGET-DNDC Decision Support System is being used to assess the impact of agricultural management practices on the release of carbon and nitrogen to air and water. The goal is to be able to develop site-specific best management practices for increasing soil carbon and reducing nitrogen emissions and losses in a given site. NUGGET-DNDC was developed with support from the USDA Small Business Innovative Research program. For more information on the NUGGET-DNDC mapping tool, contact William Salas at wsalas@agsemail.com. Nitrous oxide (N2O), the third most abundant greenhouse gas, is closely tied to production agriculture. Agriculture activities accounted for 76 percent of N2O emissions in the U.S. in 2005, and 86 percent globally, according to the U.S. Energy Information Administration. These activities include the application of organic and inorganic fertilizers, planting nitrogen-fixing crops, burning plant residue, managing manure, and adding nitrogen to water sources from field runoff, according to the U.S. Environmental Protection Agency. Much attention has been targeted toward carbon dioxide, which is the most abundant greenhouse gas in the atmosphere; however, N2O is about 300 times more powerful due to its duration in the atmosphere and its heat-absorbing capabilities. Each greenhouse gas is given a carbon equivalent, or a value of global warming potential. Carbon dioxide is the baseline of this scale with a value of one. Methane has a value of 21, and N2O has a value of 310, making it much more effective at warming the atmosphere. Nitrogen naturally enters the soil through the activities of nitrogen-fixing bacteria (and blue-green algae), and the deposition of animal wastes. Even if there were no human activity, these processes would occur and convert inert atmospheric nitrogen into forms that are essential to plant and animal life. Nitrogen-fixing bacteria absorb atmospheric nitrogen and transform it into ammonia (NH3). Some nitrogen-fixing bacteria are free-living in soil and water, while others are symbiotic with certain plants, fungi, and other organisms. The NH3 produced by symbiotic bacteria is rapidly converted into certain amino acids within the plants. Once this nitrogen is incorporated into plant tissue, it then cycles back into the soil as organic residue. As organic matter is decomposed, the nitrogen is transformed into ammonium (NH4) and simple organic compounds. The NH4 then goes through the microbial-driven processes of nitrification and denitrification. Nitrification and denitrification are driven by the activity of microorganisms in soils. 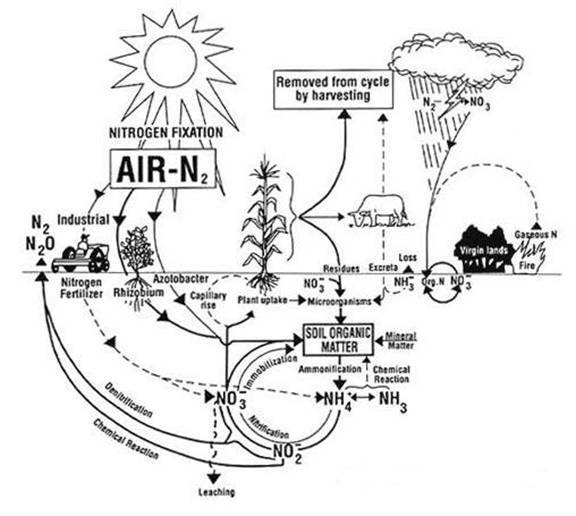 Nitrification is the aerobic microbial oxidation of ammonium (NH4) to nitrate (NO3). In a well-aerated soil, most of the ammonium in the soil is converted into nitrate. Denitrification is the anaerobic microbial reduction of nitrate to nitrogen gas (N2). Nitrous oxide is a gaseous intermediate product in the reaction sequence of denitrification, which leaks from microbial cells into the soil and then into the atmosphere. Nitrous oxide is also produced during nitrification, although by a less well-understood mechanism. Nitrogen also enters the soil as a direct result of human activities, and this has a significant indirect effect on nitrous oxide emissions. Nitrogen additions through human activities are done mainly through organic and inorganic fertilization. Both sources of nitrogen fertilizer lead to increased levels of mineral and organic nitrogen in the soil, which lead to higher rates of nitrification and possibly denitrification. Also, the planting of nitrogen-fixing crops such as soybean and alfalfa is a human activity that increases the natural process of nitrogen fixation in the soil. Burning crop residues also contributes to N2O emissions due to the incomplete combustion of agricultural waste, but occurs on a much smaller scale than fertilizer applications. Studies are underway to understand how agricultural and land-use management practices can affect N2O emissions, but this has not yet been extensively researched. Manure management, for example, plays a factor in nitrous oxide emissions, but methane has been researched more intensively than N2O on this subject. Research has shown that inorganic nitrogen application practices can have a significant effect on N2O emissions, but more work is needed on this topic. An indirect source of N2O emissions is from water leaching and runoff from agricultural fields. Applied nitrogen fertilizer and manure that is not absorbed by crops may leach through the soil or wash into surface waters. There, part of the nitrogen is converted into N2O through denitrification. Some believe that water runoff is a major contribution to N2O emissions, but little research has been done to determine that. Nitrous oxide emissions vary greatly from region to region, depending on agricultural production and waste management practices, climate, soil type, and transportation factors. For example, temperate, intensive agricultural areas such as the Midwestern U.S. will produce much more nitrous oxide than other areas because of the quantities of nitrogen that are added to the soil. The process involves a light that is directed at the soil through a sapphire window. The window is pressed directly against the soil and is pulled 5 cm below the soil surface. The light bounces off the soil, and is broken into wavelengths like a prism. Those wavelengths can be calibrated to produce a carbon map of the field. A companion NIR probe is used to measure soil carbon up to 60 cm below the soil surface to get carbon measurements at a wide range of depths. The advantages are that hundreds of carbon measurements can be taken at a time, and no soil preparation is needed, says Eric Lund of Veris Technologies. Near-infrared light waves are between visible light waves and microwaves on the electromagnetic spectrum. NIR spectroscopy has been used since the 1950s to test grains, feeds, meat, and other biological materials. It has also been used in the pharmaceutical industry because of its nondestructive nature, according to a presentation titled “Mapping Soil Carbon with On-The-Go Near Infrared Spectroscopy” by Colin Christy of Veris Technologies (http://www.oznet.ksu.edu/ctec/Fall%20Forum%20pdf%20files/Papers_Abstracts/Christy_Veris.pdf). Portable pull-behind NIR technology for in-field measurements has been pursued since the 1980s. NIR takes carbon measurements, says Lund, but it doesn’t take samples. 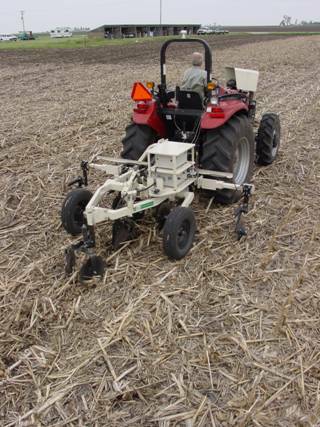 The machine can compare how much relative carbon there is from one area to the next, but cannot determine the actual amount of carbon in the soil until it is calibrated against a standard. To get actual carbon readings, a few core samples need to be pulled from the field and sent to the lab. There, carbon levels are analyzed by using the traditional method of dry-combustion. That data is then calibrated to the NIR measurements using advanced chemometric techniques, which then results in a carbon estimate for each area of the field. For maximum accuracy, this should be done on a field-to-field basis -- and in the future, an area-to-area basis, says Lund. The process can take days if the samples have to be newly calibrated. But if previously collected data are used, carbon levels can be determined minutes after NIR measurements are collected, making the total process relatively quick. Lund says field testing in several states hasn’t revealed any major interferences for the machine when used in most agricultural fields. Possible interferences could be very rocky soil, or soil that is predominantly composed of limestone. NIR only responds to organic carbon, and the machine could underestimate the amount of inorganic carbon in limestone soils. Also, if measurements need to be taken in a forest or other area where tractors are hard to maneuver, there might be problems because of the overall design of the machine. In that case, the companion probe would be used. Lund says that like any technology, there is room for improvement, and that more research needs to be done about carbon measurement in general. Lund and other researchers at Veris Technologies are working to make NIR an easy and efficient way to assist in a future carbon credit program. Figure 1. 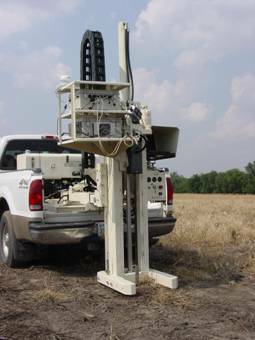 The NIR equipment from Veris Technologies making field measurements using a shank. Figure 2. To calibrate the NIR equipment readings, soil probes are first used to determine actual soil carbon levels. The Climate Group, the International Emissions Trading Association (IETA), and the World Business Council for Sustainable Development (WBCSD) launched a new global carbon offset standard at the London Stock Exchange on Nov. 20, 2007 to increase participation and confidence in the global voluntary carbon market. The Voluntary Carbon Standard (VCS) provides a quality assurance check for voluntary offset projects, and is designed to complement and support other credible approaches to verifying carbon emission reduction practices. The transparency of the new VCS is designed to boost market confidence in the voluntary carbon market. Market analysts estimate that annual transactions in the voluntary carbon market could reach $4 billion in the next five years and that the VCS - already popular with buyers - will be instrumental to this future growth, according to the Voluntary Carbon Standard Association.